WHAT IS IT? The Model MSD is comprised of two different components, a control unit (digital display) and a speed sensor (pulse generator). The Model MSD-800 control unit is a programmable unit that has two setpoints permitting it to indicate two under-speed points or two over-speed points, or one of each. The control unit acts as a digital tachometer that constantly displays the actual speed of the equipment being monitored. The Model MSD-1 speed sensor installs directly to the shaft of the rotating equipment to be monitored and is enclosed in a rugged cast aluminum housing designed to withstand harsh environments. WHY IS IT NECESSARY? 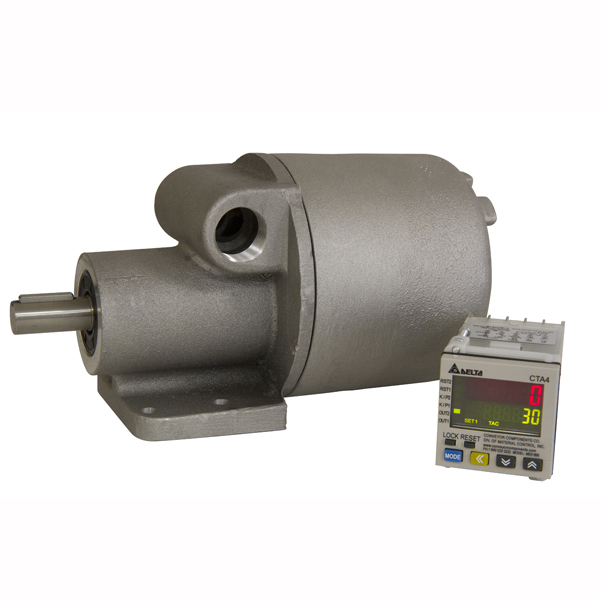 The Model MSD alerts the operator of a change in rotary speed. It sends a signal to the control unit which can be used to sound an alarm and/or shutdown the equipment completely. By monitoring speed you can greatly reduce system and equipment downtime by fixing malfunctions such as broken drive gears or belts, overworked motors, belt overload and other problems before serious damage occurs. Epoxy coating option: add $12.00 to price, add "E" to end of model number (MSD-1E or MSD-1XE). MSD-14 Three conductor shielded cable to connect control unit and sensor 0.02 lbs./ft. $0.45/ft. The controller is programmable with two setpoints. Indicates two under-speed points or two over-speed points, or one of each. The controller is easily field adjustable to desired speed setpoints. Controller acts as a tachometer. LCD display shows shaft RPM. Not recommended for speeds slower than 1 RPM. Controller Input Power: 100-240 VAC (optional 24 VDC available). Controller is a Panel Mount Style, 1/16 DIN panel mount for easy access. Controller contains one SP/ST relay (Output 1), one Transistor (Output 1), and one SP/DT relay (Output 2) and corresponding output contacts. The sensor is enclosed in rugged cast alumnium housing. Epoxy coating optional, add "E" to end of model number. The MSD-1 and MSD-1X sensor (encoder) has a 50 segment brass encoder disk (yielding 50 pulses per revolution) back to the MSD-800 (or MSD-800-24) controller. The sensor is NEMA Type 3S, 4, 4X weatherproof and dust tight. Sensor is available in explosion proof model NEMA Type 7: Class I, Groups C, D; Type 9: Class II, Groups F, G.
Sensor operating temperature range is 14ºF to 131ºF (-10ºC to 55ºC). The sensor is mounted to the shaft by drilling (4) 5/16" diameter holes. The sensor has (2) 3/4" NPT conduit openings. Maximum separation distance between controller and sensor is 4,000 feet. The sensor and controller are connected via a two conductor shielded cable (Belden 8760), sold seperately.